A baker who sees the dead. One too many suitors. And a killer. Living in Honey Hollow can be murder. My name is Lottie Lemon and I see dead people. Okay, so I rarely see dead people, mostly I see furry creatures of the dearly departed variety, aka dead pets. And for some reason those sweet, fluffy albeit paranormal cuties always seem to act as a not-so-great harbinger of deadly things to come for their previous owner. So when I saw that sweet orange tabby twirling around my landlord’s ankles, I figured Merilee was in for trouble. Personally, I was hoping for a skinned knee—what I got was a top spot in an open homicide investigation. Throw in a hot judge and an ornery detective that oozes testosterone and that pretty much sums up my life right about now. Have I mentioned how cute that detective is? From the NEW YORK TIMES and USA TODAY bestselling author, Addison Moore— Cosmopolitan Magazine calls Addison's books, "...easy, frothy fun!" How could anyone resist an amateur sleuth who bakes the best of everything, is able to see departed pets, gets herself into the most awkward situations and still sees the beauty of the seasons. I am a devoted Lottie fan. Near the end of the book Lottie has a powerful epiphany which everyone in the world would benefit from taking notice of. You will know it when you read it. 5.0 out of 5 starsAn enjoyable read. I enjoyed this book, it was easy to read and characters were believable and easy to follow. Another cozy mystery that is so easy to read. The book has an underlying theme of food, adventure and of course the right amount of romance. 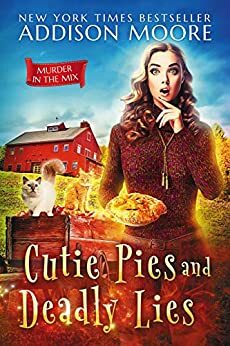 There is delightful entertainment during every scene in CUTIE PIES AND DEADLY LIES, as the story is original and its characters are particularly appealing. The key factor for a cozy mystery is present as the main character finds herself involved in a murder, and though she has no training, her goal is to expose the real killer. There is even a fascinating aspect related to the paranormal, which is inventively creative. I have previously enjoyed books written by Addison Moore, and her talent shines in the newest genre that she tackles. When Lottie Lemon see the ghostly apparition of a cat rubbing against one of the women who is suing her, she hopes the individual does not have the best day. For some reason, the Honey Hollow resident is able to see animals that have passed away, and each time it occurs, the person to whom they are attached has something rather bad happen. But this time, the event which takes place is truly grave, as the individual turns up dead. Lottie is immediately being put on the list of who is to blame for the terrible deed, and she is not going to let anyone stop her from uncovering the truth. With her bubbly personality and quick wit, it was easy to really like Lottie. I found her to be pleasantly charming, and many of her comments left me with a big smile. Her relationship with her family proved her devotion, while how she acted with friends showed how much she cared. When it comes to the new men in her life, her reactions are often amusing because of her candid thoughts and great retorts. Several scenes are very comical, yet there are also some more somber moments when genuine feelings are discussed. The whole story is colorfully depicted, from the town’s fall activities to the many delicious treats that are baked by Lottie. I really want the chance to try a few of them since I love apples. The MURDER IN THE MIX series starts off with a riveting story filled with intrigue, a little romance, and lots of engaging characters. 3.0 out of 5 starsA disappointment. It is a book with a lot of contradictory elements. The descriptive writing is lovely. It makes the Vermont countryside come alive beautifully. Unfortunately, the plot, character development and editing are weak. It follows the usual formula: home town girl returns after being battered in the big city, finds a dead body, feels compelled to investigate despite being warned off by hunky detective. There is more romance than mystery and to say there is an investigation would be generous. In general, not very satisfying. 3.5 stars. I enjoy cozy mysteries as they are great palette cleansers for me. This story was good, but was a bit long winded. Every character, every action, every building (etc. ), was introduced with a great amount of description. This is okay for longer books, but in this story it was too much. I loved Lottie Lemon, she was a wonderful and fun character. Her clumsiness was a delight and her baking was great. I did feel she was a bit over the top at times and came across as too childish, but over all a great leading lady. The men in the story kept me interested and the other secondary characters were a great addition. I especially liked Pancake. I did not really feel the mystery aspect of the story. Due to the fact the author spent so much time introducing characters and the town; I felt the mystery was a second thought. I was suprised with the ending, so there is that. I am hoping because thus us only book one; tgat the other stories will have more emphasis on the mystery and les on setting up the town. Inwill be reading the others in the series in time. 4.0 out of 5 starsRecipes? Challenge 14 of the 2019 Book Riot Read Harder Challenge is "A cozy mystery." Now I'll admit that cozy mysteries are one of my guilty pleasures, and have been for long before I'd ever heard of the genre. Mary Daheim, Diane Mott Davidson, Tamar Myers all have multiple works on my personal library shelves, and I'd even suggest that Rita Mae Brown's Sneaky Pie books fit the mold as well. While there isn't exactly a formula involved, cozy mysteries often revolve around a women who inadvertently gets mixed up in a murder investigation. Quite often, our protagonist is the suspect, or perhaps a close friend or relative of the primary suspect, and acts to clear her own or her acquaintance's name. Often, as in this book, the protagonist is a cook or baker, and often there are recipes included in the text. Addison Moore doesn't include recipes, but I wish she would. Some of the desserts Lottie Lemon creates sound scruptious and I'd love to try them out. As in many of these cozy mysteries, several people could well be the killer, and Lottie puts her own life in danger as she attempts to solve the case. And again as is often the case, there is a handsome hunk of a man who tries in vain to keep Lottie out of trouble. In fact, in this book there are three men who seem to be drawn to Lottie's flame. The victim is perhaps the least likeable character in the story, and the actual killer was, to me at least, a complete surprise. But in fairness, I never try to figure out whodunit. I prefer to let the text carry me along for the ride, and in this case I thoroughly enjoyed the outing. Highly recommended to my cozy mystery reading friends. I look forward to reading more by Addison Moore. 4.0 out of 5 starsAn interesting start to this quirky series. Lottie Lemon finds herself at the center of a murder mystery in her small Vermont hometown. She discovers a dead body and instantly becomes one of the prime suspects. Her former landlord and her just had an unceremonious ending the day before and Lottie is instantly questioned about her possible role in the murder. What ensues were some pretty funny, quirky and interesting moments. Lottie finds herself with a new suitor and, apparently, some old ones still looking to rekindle their romance. The book did get a bit whimsical and had too much unnecessary dialogue at points. It was a fast, easy read though and I was quite charmed by the Vermont setting in the book. Am interested to see what happens next.